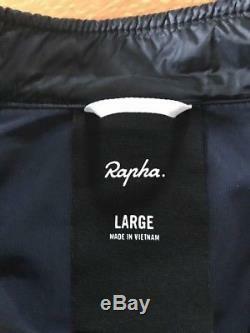 Long-distance riders can encounter a full range of weather conditions, so a lightweight layer that is both warm and packable is essential. The Brevet Insulated Jacket provides exceptional warmth, while highly breathable Polartec® Alpha® insulation ensures you wont overheat during harder efforts. Extensively tested across a range of conditions: from the Transcontinental race across Europe, to the cold summits of Australias snowy mountains. This versatile jacket is made for days when the weather is hard to predict. The fast-drying and hydrophobic properties of Polartec® Alpha® mean the jacket wont hold water like natural down insulation and with a DWR (durable water repellent) coating you can watch the rain roll off. Soft, brushed jersey side panels add warmth and allow the jacket to stretch over full pockets, while reflective detailing increases visibility in low light. When not in use the jacket rolls up neatly, secured by an elasticated loop at the neck. 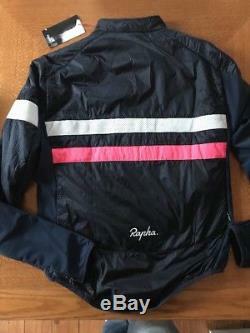 The item "Rapha Brevet Insulated Jacket Navy BNWT Size L" is in sale since Saturday, December 30, 2017. 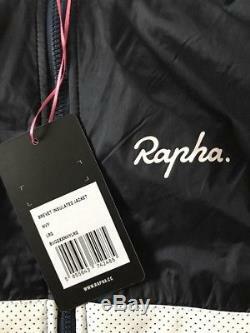 This item is in the category "Sporting Goods\Cycling\Cycling Clothing\Jackets". 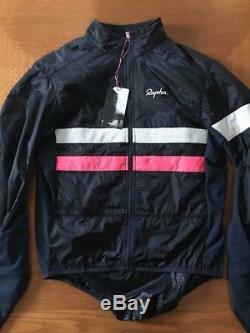 The seller is "dagreynolds66" and is located in Kingston upon Thames, Surrey. 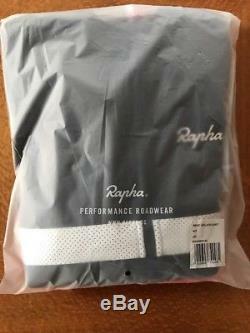 This item can be shipped to United Kingdom, Antigua and barbuda, Austria, Belgium, Bulgaria, Croatia, Cyprus, Czech republic, Denmark, Estonia, Finland, France, Germany, Greece, Hungary, Ireland, Italy, Latvia, Lithuania, Luxembourg, Malta, Netherlands, Poland, Portugal, Romania, Slovakia, Slovenia, Spain, Sweden, Australia, United States, Russian federation, Canada, Brazil, Japan, New Zealand, China, Israel, Hong Kong, Norway, Malaysia, Singapore, South Korea, Switzerland, Taiwan, Thailand, Bangladesh, Belize, Bermuda, Bolivia, Barbados, Brunei darussalam, Cayman islands, Dominica, Ecuador, Egypt, Guernsey, Gibraltar, Guadeloupe, Grenada, French guiana, Iceland, Jersey, Jordan, Cambodia, Saint kitts and nevis, Saint lucia, Liechtenstein, Sri lanka, Macao, Monaco, Maldives, Montserrat, Martinique, Nicaragua, Oman, Pakistan, Peru, Paraguay, Reunion, Turks and caicos islands, Aruba, Saudi arabia, South africa, United arab emirates, Ukraine, Chile.